If you’re ever in need of detectives to solve a case, Wells & Wong Detective Society will surely be up to taking your case. At their English boarding school, Deepdean School for Girls, set in the 1930s, Wells and Wong have solved the case of Lavinia’s missing tie, little missing knick knacks, and oh, a frickin’ murder! These girls were thrown into a dangerous murder mystery when Hazel finds the dead body of their teacher, Miss Bell, lying on the floor of their gym with a head wound. Who did it? Wells and Wong got immediately on the case, and boy oh boy, these brave girls are exceptional detectives. You get to see detectives at work! Think Nancy Drew, or any of your favorite kid-detectives! Perhaps even Sherlock and Watson. That’s what Daisy Wells and Hazel Wong are in this adorable Middle Grade. They’re acting as detectives, trying to get to the bottom of the murder of Miss Bell. You get to see how they get information and how they solve the murder. 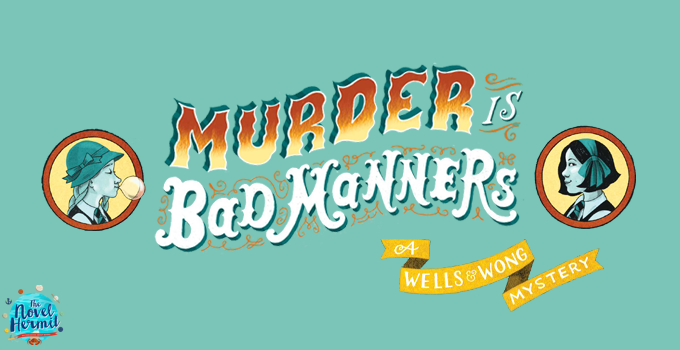 Murder Is Bad Manners is told entirely from Hazel Wong’s point of view. You may ask, why is this so exciting? Well, it’s because it’s told from a Chinese character’s point of view, instead of the blonde English girl! How many books have you read that had the Asian character narrating? Not many! I love that she’s as much of a main character as her best friend, Daisy; she isn’t shoved to the background. They have equal footing in this book, and that’s what I love to see. You join two brave girls—Daisy Wells and Hazel Wong—who keep investigating despite the danger that lurks. You have Daisy Wells, the self-assured and demanding English rose, and Hazel Wong, the cautious foreigner who just wants to fit in. Daisy can be reckless and dismissive of Hazel because she gets caught up in the thrill of the case. (It can get frustrating at times, especially if you’re Hazel.) Hazel is more level-headed and tries to get Daisy to see that they could be in serious danger. These two girls may be extremely different, but they balance each other out and push each other to do things they wouldn’t ever do. Daisy and Hazel are incredibly clever, and they use their wits to get as much information even if it’s dangerous. With their combined forces, they’re an effective team to solve a murder. A murder has occurred right under their noses. It’s not every day young girls get to investigate a murder. This murder case of their teacher, Miss Bell is a major game changer in Daisy and Hazel’s career as detectives. I was absolutely riveted by the case. I loved seeing these girls slowly piecing together the timeline of Miss Bell’s murder by gathering evidence and ruling out the other teachers. It’s not fun and games even though it may be thrilling to be entangled in an investigation; lives are at stake, and I loved seeing these girls realize the danger of what they found. Do I recommend Murder Is Bad Manners? YES. This is the type of Middle Grade I would’ve cherished when I was younger because it is a detective story (sleuths are awesome! ); it’s set in 1930s (which is a time period I love reading about); it is narrated by an Asian character, who is one of the main characters; and it’s overall just so much fun. Join Wells & Wong’s Detective Society now! It took me a while to get really into it, but I really enjoyed this one! I thought it was a fun middle grade read (if a bit darker than I expected), and I definitely think I’ll continue on with the series. It sounds like such a good book! I definitely still love reading middle grade books before I pass them off to my cousins so I know who’ll appreciate what. Thanks for giving me the idea for this one!